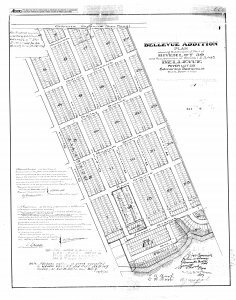 Design of Bellevue street blades, featuring John Fraser, pioneer owner of River Lot 28. The Bellevue Decorative Street Light Committee is very pleased to present the design that will be used for the sign blades which will be installed with our new street lights. We are extremely grateful to Bellevue resident Ken North (North Design Group) who donated his time and talent for this project! The original illustrated graphic at the top of our sign pays homage to our pioneer river lot owner, John Fraser. In our research on this amazing man, we learned that John Fraser was a very active member in the community and a strong supporter of education, and that he had many other talents and successes. The story about John Fraser that inspired Ken’s graphic for the sign blades highlights Fraser’s physical fitness, stamina, and grit. When he was a young man, he was master of winter transportation for the Hudson’s Bay Company. He was a dog sled driver and one of the very best of his day. The story goes that on one special occasion he drove a Hudson’s Bay officer, in one day from sun up to sun down, from Edmonton to Lac Ste. Anne and back. This is a distance of approximately 80 km each way. It was mentioned that as the dog driver, he did not ride on the sled except on the occasional downgrade; rather he ran along with it. This is an amazing feat of strength by anyone’s standards. We feel that his determination, and his commitment to community, lives on in the neighbours who now occupy the strip of land that he settled! 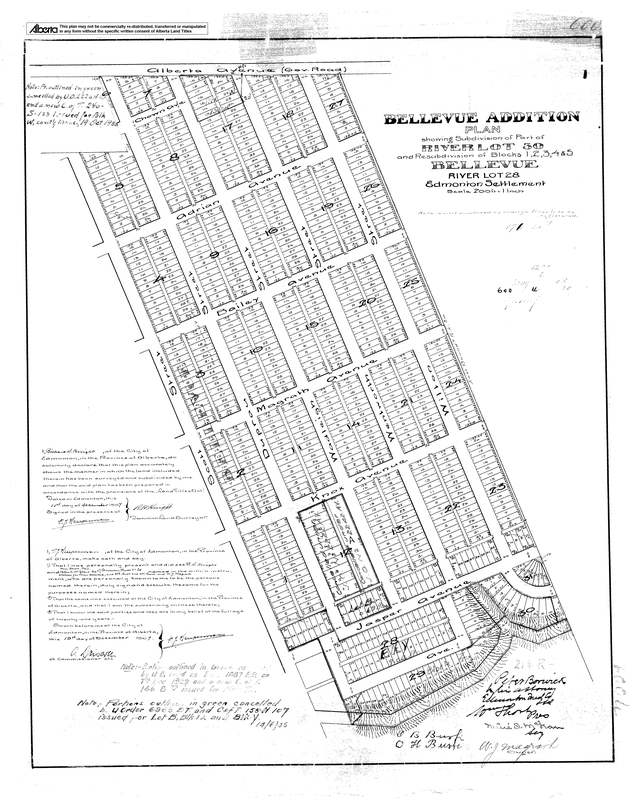 The new sign blades will include the historical street names from the original subdivision plans for Bellevue (River Lot 28) from 1906 and 1907. The new decorative lights and sign blades will be installed south of 112 Ave in the new year, and north of 112 Ave once the sidewalk and road reconstruction is complete (which is scheduled to happen in 2019). We look forward to seeing these final enhancements to our neighbourhood. 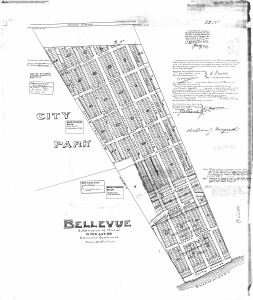 Relatedly, Joe Hewko (from the Bellevue Decorative Street Light Committee) has been in discussion with the City (Sherry Wallace, Building Great Neighbourhoods Project Manager), asking them to inspire and co-ordinate with Virginia Park, Bellevue, Highlands, and the Highlands Historical Society regarding establishing points of interest along Ada Boulevard. These would highlight the history of the river lots of this area. 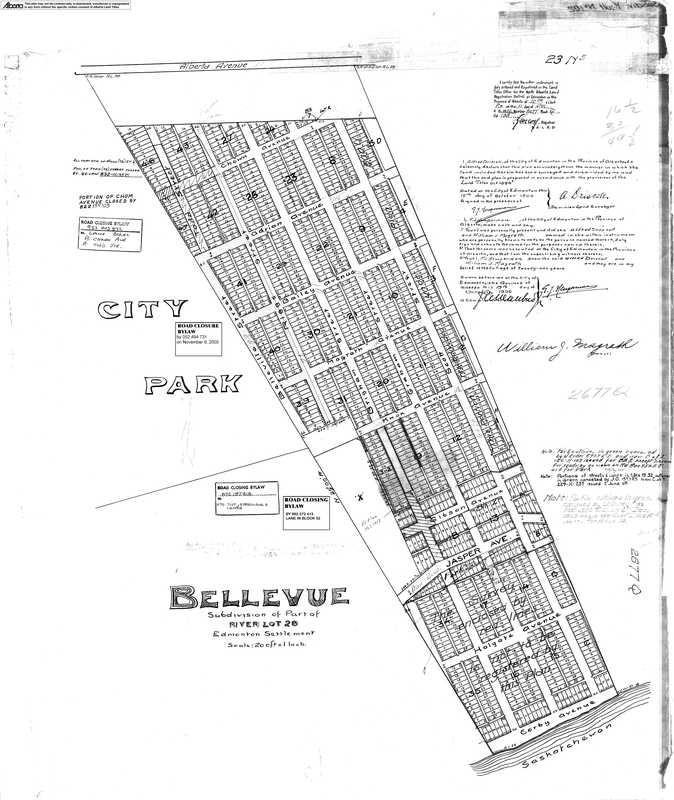 Such a project would dovetail nicely with the efforts that have been made to recognize our history with the new street lights and sign blades in Bellevue and Virginia Park. If this is an idea you support, please get in touch; the community league can pass your info on for updates and potential involvement.